Lao-tzu’s Tao Te Ching, or Book of the Way, is the classic manual on the art of living, and one of the wonders of the world. In eighty-one brief chapters, the Tao Te Ching looks at the basic predicament of being alive and gives advice that imparts balance and perspective, a serene and generous spirit. This book is about wisdom in action. It teaches how to work for the good with the effortless skill that comes from being in accord with the Tao (the basic principle of the universe) and applies equally to good government and sexual love; to child rearing, business, and ecology. Stephen Mitchell’s bestselling version has been widely acclaimed as a gift to contemporary culture. Tao Te Ching (pronounced, more or less, Dow Deh Jing) can be translated as The Book of the Immanence of the Way or The Book of the Way and of How It Manifests Itself in the World or, simply, The Book of the Way. Since it is already well known by its Chinese title, I have let that stand. About Lao-tzu there is practically nothing to be said. He may have been an older contemporary of Confucius (551-479 BCE) and may have held the position of archive-keeper in one of the petty kingdoms of the time. But all the information that has come down to us is highly suspect. Even the meaning of his name is uncertain (the most likely interpretations: “the Old Master” or, more picturesquely, “the Old Boy”). Like an Iroquois woodsman, he left no traces. All he left us is his book: the classic manual on the art of living, written in a style of gemlike lucidity, radiant with humor and grace and largeheartedness and deep wisdom: one of the wonders of the world. People usually think of Lao-tzu as a hermit, a dropout from society, dwelling serenely in some mountain hut, unvisited except perhaps by the occasional traveler arriving from a ’60s joke to ask, “What is the meaning of life?” But it’s clear from his teachings that he deeply cared about society, if society means the welfare of one’s fellow human beings; his book is, among other things, a treatise on the art of government, whether of a country or of a child. The misperception may arise from his insistence on wei wu wei, literally “doing not-doing,” which has been seen as passivity. Nothing could be further from the truth. A good athlete can enter a state of body-awareness in which the right stroke or the right movement happens by itself, effortlessly, without any interference of the conscious will. This is a paradigm for non-action: the purest and most effective form of action. The game plays the game; the poem writes the poem; we can’t tell the dancer from the dance. Nothing is done because the doer has wholeheartedly vanished into the deed; the fuel has been completely transformed into flame. This “nothing” is, in fact, everything. It happens when we trust the intelligence of the universe in the same way that an athlete or a dancer trusts the superior intelligence of the body. Hence Lao-tzu’s emphasis on softness. Softness means the opposite of rigidity, and is synonymous with suppleness, adaptability, endurance. Anyone who has seen a t’ai chi or aikido master doing not-doing will know how powerful this softness is. The teaching of the Tao Te Ching is moral in the deepest sense. Unencumbered by any concept of sin, the Master doesn’t see evil as a force to resist, but simply as an opaqueness, a state of self-absorption which is in disharmony with the universal process, so that, as with a dirty window, the light can’t shine through. This freedom from moral categories allows him his great compassion for the wicked and the selfish. The reader will notice that in the many passages where Lao-tzu describes the Master, I have used the pronoun “she” at least as often as “he.” The Chinese language doesn’t make this kind of distinction; in English we have to choose. But since we are all, potentially, the Master (since the Master is, essentially, us), I felt it would be untrue to present a male archetype, as other versions have, ironically, done. Ironically, because of all the great world religions the teaching of Lao-tzu is by far the most female. Of course, you should feel free, throughout the book, to substitute “he” for “she” or vice versa. As to method: I worked from Paul Carus’s literal version, which provides English equivalents (often very quaint ones) alongside each of the Chinese ideograms. I also consulted dozens of translations into English, German, and French. But the most essential preparation for my work was a fourteen-years-long course of Zen training, which brought me face to face with Lao-tzu and his true disciples and heirs, the early Chinese Zen Masters. With great poetry, the freest translation is sometimes the most faithful. “We must try its effect as an English poem,” Dr. Johnson said; “that is the way to judge of the merit of a translation.” I have often been fairly literal — or as literal as one can be with such a subtle, kaleidoscopic book as the Tao Te Ching. But I have also paraphrased, expanded, contracted, interpreted, worked with the text, played with it, until it became embodied in a language that felt genuine to me. If I haven’t always translated Lao-tzu’s words, my intention has always been to translate his mind. as someone crossing an iced-over stream. 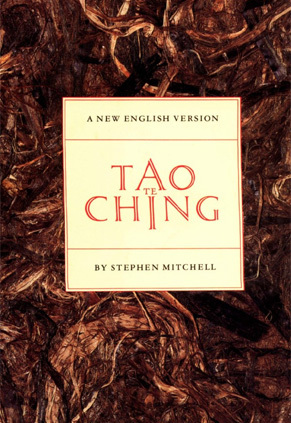 I read the Stephen Mitchell translation of the Tao Te Ching in one sitting, three times. It is stunning, so lovely. It is a treasure. [This translation] comes as close to being definitive for our time as any I can imagine. It embodies the virtues its translator credits to the Chinese original: a gemlike lucidity that is radiant with humor, grace, largeheartedness, and deep wisdom. Stephen Mitchell’s great talent is to communicate with the profound simplicity utterly appropriate for this task. The obscure has been made transparent and available. [This is] a book beautiful in every respect. Stephen Mitchell is an extraordinary scholar and translator. His rendition of the Tao Te Ching is beautiful and accessible; the English, as “fluid as melting ice,” is a joy to read throughout. Mitchell…has translated the Tao Te Ching…with passion and scholarly dexterity. None of the other translations comes off as smooth, clear, and simple — as Taoist — as this one… His intuition and willingness to improvise revitalizes the message of the Tao Te Ching.